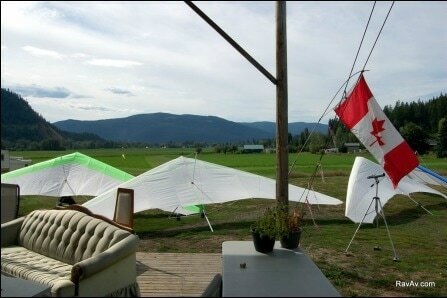 "Lumby is a must-fly area for paragliding and hang gliding enthusiasts. The dry climate, numerous safe launch sites, abundant flat landing sites and constantly excellent thermals make for a great experience." - Destination BC Corp. Whether you're an experienced pilot, eager learner or new visitor, everyone is welcome to visit the Freedom Flight Park & Schools. An outdoor covered deck known as the "pilots' lounge" provides a comfortable area for pilots, students, friends & family to watch the flying fun. Two launch sites, Cooper's and Saddle, are visible from the landing zone and you can even see the windsocks at both launches with our telescope or binoculars. 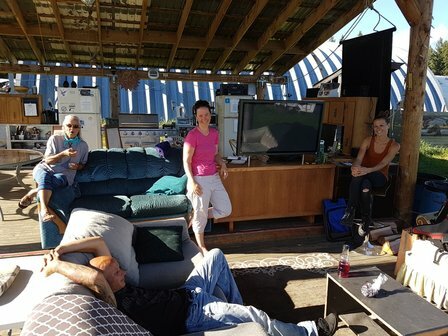 An outdoor barbecue, microwave, espresso machine, toaster oven, electronic charging station, desktop computer and stocked fridge (food & drink by donation) is available on the deck. So bring a picnic or some burgers for the barbie. ​Alternative entertainment can also be found at the Flight Park including games (darts, ping pong, koob), communal gardening (coming soon! ), good food, nightly campfires, guitar music jams so bring your own instruments and all-around good people. Don't want to camp at the flight park? There are many activity and accommodation alternatives a few minutes away in downtown Lumby or... in Vernon a larger city (just a 25 minute drive away). Multiple lakes with campgrounds abound in all directions 15-30 minutes away. Many hot springs are about 2.5 hours to the east near Nakusp. Lumby, BC is a "Hang Gliding and Paragliding Capital" in Canada. The area offers the dedicated Freedom Flight Park, at the base of the famous Cooper's Launch, has the most number of mountain launches in one area in the country and has one of the longest good flying seasons in Canada. 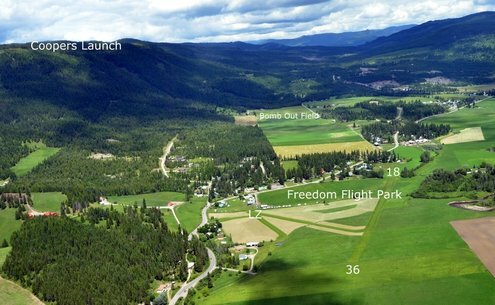 West of Lumby towards Vernon, the King Eddy & Baldy site provide a west facing launch but due to a change in the aircraft approaches to Kelowna International Airport, there is a hard ceiling at 6200' ASL that pilots must adhere to. Across the valley is south facing Vernon Mountain which offers a grassy take-off slope and plenty of open landing zones. 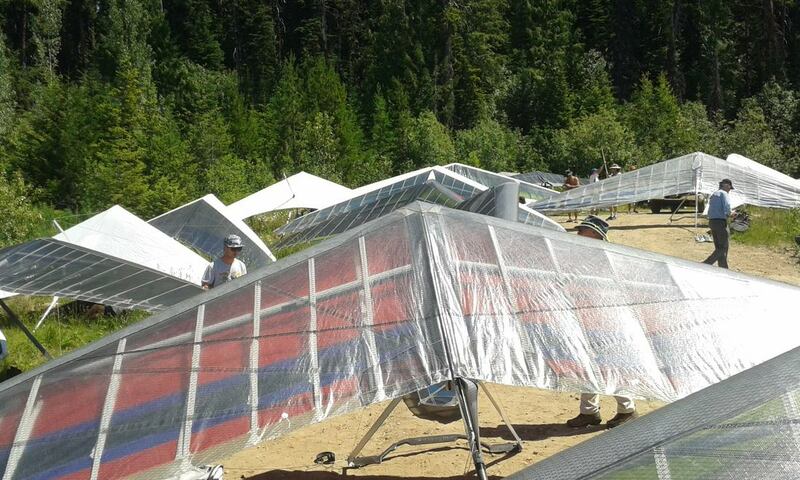 For more information, visit the Okanagan Soaring Society's website. ​If you do go flying on your own in the area, please be aware of these Policies & Procedures. 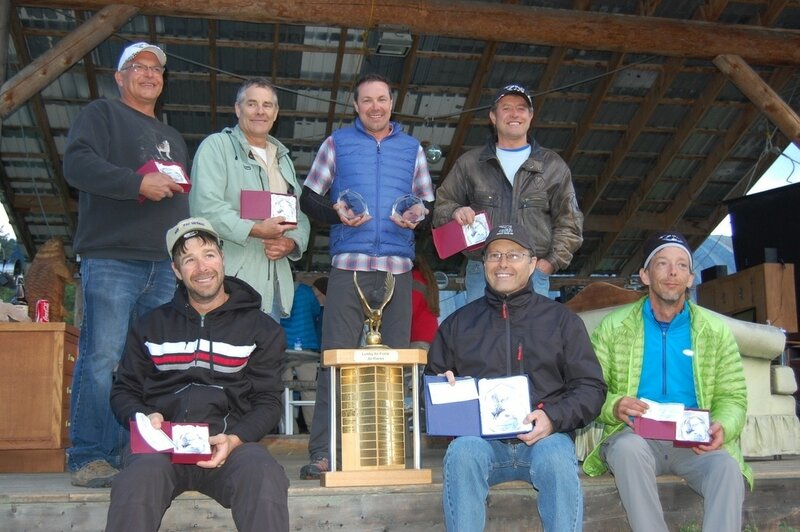 ​Canadian Hang Gliding Championships - We have hosted this event numerous times with the last one being in 2015. Likely the nationals will return to the Freedom Flight Park in 2018 or 2019. Some top pilots from around the world attend this event. 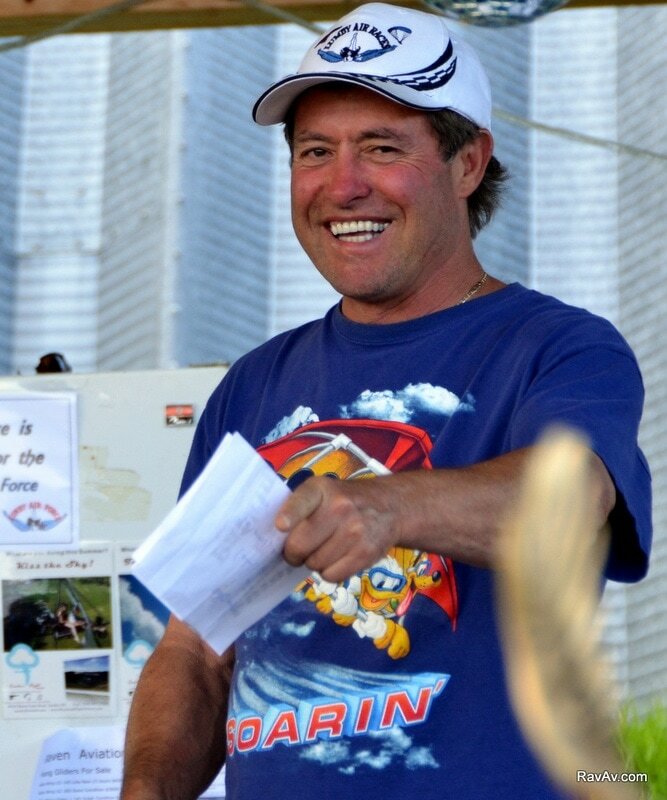 ​Lumby Air Races - For a week in June, the skies above Lumby host a rainbow spectacle of colorful paragliders and hang gliders before and leading up to the town's annual fair, Lumby Days. Pilots attempt to fly a closed circuit triangular course using GPS instruments for scoring to earn top honors and prize money. 2019's event takes place from June 2nd-8th. SiccyTown Splash Down - This waterside spot-landing event takes place in the town of Sicamous, between Mara and Shuswap Lake. It is what's called a "Spot Landing" competition as pilots attempt to land in an inflatable kiddies pool on the beach. Flyers and spectators prepare to get wet! The event is followed by beach-side fun, boat cruising, and late night music. This event is not annual and only takes place in opportune seasons. Thanksgiving Bomb Drop - This season finale event takes place on October's Thanksgiving weekend to celebrate the close-out of the flying season. Pilots launch off the mountain with "bombs" (small paper bags with flour) and attempt to hit a target in the landing field. The closest bomb determines the champion who gets first dibs on dinner. Pilots and their guests are invited to participate and share a Thanksgiving potluck dinner of good fun and flying. Community - Check the Lumby Community board for what's new in the area or stop by the Lumby Visitor center at 1882 Vernon St for brochures and ask the staff about details on paragliding and hang gliding in the Lumby area. What else can you do besides flying?! Possibly your non-flying significant other needs to stay occupied so you can fly, fly, fly... Well luckily the surrounding area is chock full of outdoor activities in stunning natural settings. Mabel Lake, Kalamalka Lake and Echo Lake all offer great opportunities in swimming, fishing, and boating, while the Shuswap River offers adventurous tubing and cliff jumping. 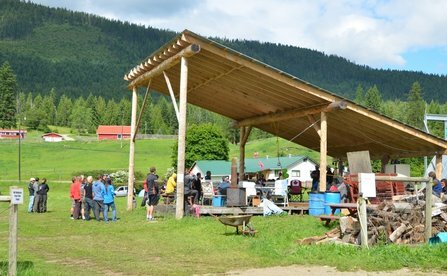 The scenic valley offers great hiking, biking, ATVing, golfing, horse back riding and local attractions like Vernon's Magnetic Hill are a fun day trip. In the evening catch a couple of movies at one of Canada's last drive-in movie theatres near Enderby. ​The Saturday Public Market is a great way to buy locally grown produced or crafted pieces. The Freedom Flight Park would love to see its own gardens grow and invites anyone with a green thumb to grow their own mini garden. Vernon itself is a small city with great taste in food and great styles! Map out a bargain in Vernon's many thrift shops or walk downtown and visit the myriad of shops and admire the local murals. The owner of the Freedom Flight Park, Randy Rauck, wrote this song and it is commonly played around the campfire after a fun day of flying. Come to the flight park and see it live...or better yet, bring your instrument and join along in the jam! Take you the whole last mile.